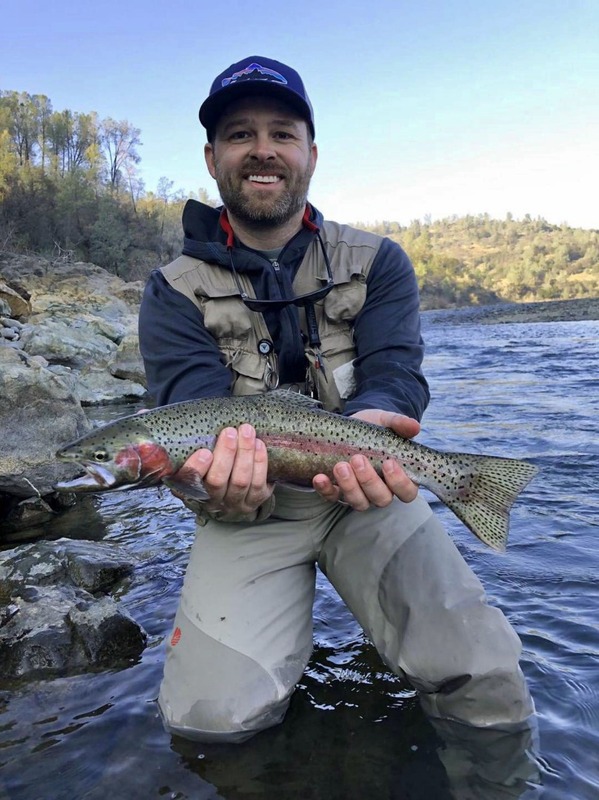 Fishing is not nearly as good on the Lower Yuba River after the last series of big storms rolled on through, but fish are still being caught. Flows are running at 1,228 cubes as recorded at the Parks Bar Bridge gauge. Deer creek has not fallen all the way down and I assume it's because of the releases from Scott's Flat reservoir; currently the creek is at 106 cfs with a slight ramping down. Water visibility is about 3.5 feet and turning slightly green. Fishing pressure has been heavy in the more popular areas, but still plenty of spots to fish if an angler is willing to walk for it. Just because an angler has fished a run doesn't mean it won't produce again, especially if you use different tactics and flies. 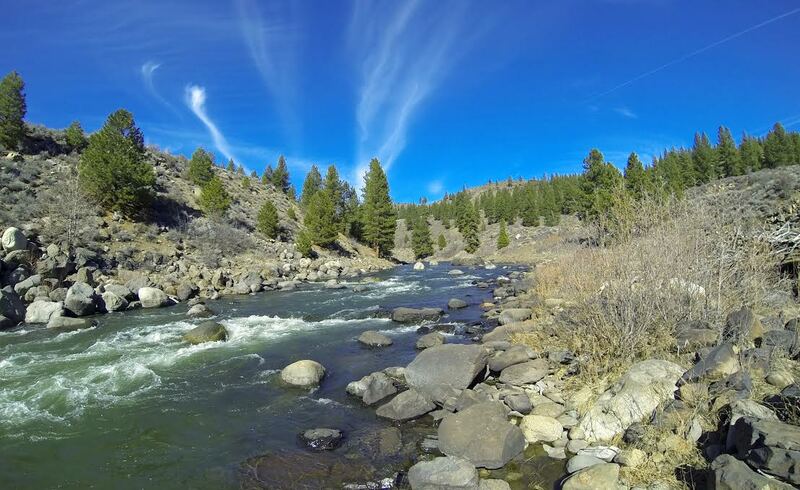 I read a lot of fishing reports for the Lower Yuba River, some are spot on, while others provide false information. I always report accurate information whether it is good or bad. Skwala stoneflies are a hot topic right now since they are out and available for the trout drifting downstream in the foam lines. 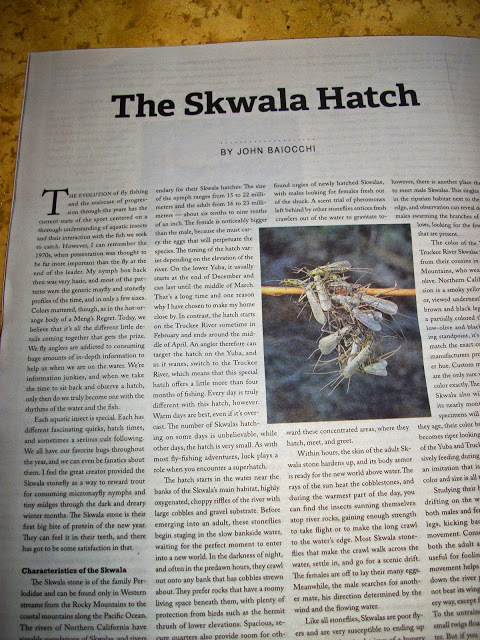 My article (Cover photo) above "The Skwala Hatch" which was featured in the December 2014 issue of California Fly Fisher is a great source of information. Behavior from nymphs to adults, fly patterns, and strategies are covered in depth. The info is from decades of being on the water studying this special stoner by my colleagues and I. If you've already read it, it's worth going back and refreshing your memory. Skwalas do not hatch in the afternoon, they hatch (metamorphosis from nymph to an adult) in the middle of the night. Skwalas become active around 12pm or when the air temperatures warm up, they are most active during the warmest time of the day and continue for a few hours more. They can live over a month or more because they can eat (pollen), and drink water. The female can also mate multiple times. There are some fish already taking the adult off the surface, and you can expect more action in the weeks to come. Look for the hatch to peak around the third week of February, and wane during the middle of March. Before the last series of storms we had BWOs, PMDs, Pinkies, and a few Gray Drakes. I have not seen very many mayflies since the last high water event, but I'm sure they will be back very soon. There is a tremendous population explosion of Glossosoma caddis (Little Brown Short-Horned Sedge) in the river right now. You can expect many evenings in spring into summer being thick with possible blanket hatches. I feel sorry for these little caddis. Once they make their home of fine pebbles, they are permanently fixed to that rock until pupation is completed. When water levels drop naturally, or man-made, they die. Unsettled weather will be moving in starting late Tuesday through Thursday with a good size storm Friday through Saturday with heavy rain in the forecast. Sunday we could see a much colder pattern drop down the coast with falling temperatures leading into a possible dry spell. The models have been inconstant looking into the long range forecast.